Nottingham Lakeside Arts welcomes the Year of the Dog, which officially begins on Friday 16 February, with a celebration of Chinese traditional and contemporary culture in which people of all ages can participate and enjoy. This year’s events include Chinese language film, activities for families, an exhibition, and a special Gala event. On Thursday 25 January the Djanogly Theatre will host a screening of Jia Zhang-Ke’s film, Still Life (15). Set against the spectacular landscape of the Three Gorges Region, this humane and moving film tells two contemplative and compassionate stories of a man and a woman searching for absent spouses in Fengjie. A BFI top ten Chinese language film (with English subtitles) the film will be presented with an introduction from a student from the University of Nottingham’s Department for Culture, Film and Media. This remarkable film will be followed by a free panel discussion considering the current state of the documentary in China, as well as the challenges and opportunities facing the country’s young film-makers today. The panel is made up of: Dr Xiaopei He, filmmaker and research associate, University of Sussex; Dr Hongwei Bao, chair of the Institute for Screen Industries Research (ISIR) at the University of Nottingham; Dr Leora Hadas, ISIR; and Dr Sabrina Qiong Yu, senior lecturer in Chinese and Film Studies, Newcastle University. On Saturday 17 February families visiting Lakeside Arts will be able to take part in the free drop-in Chinese Arts and Crafts workshops where participants will learn how to create attractive Chinese lanterns and window flowers. 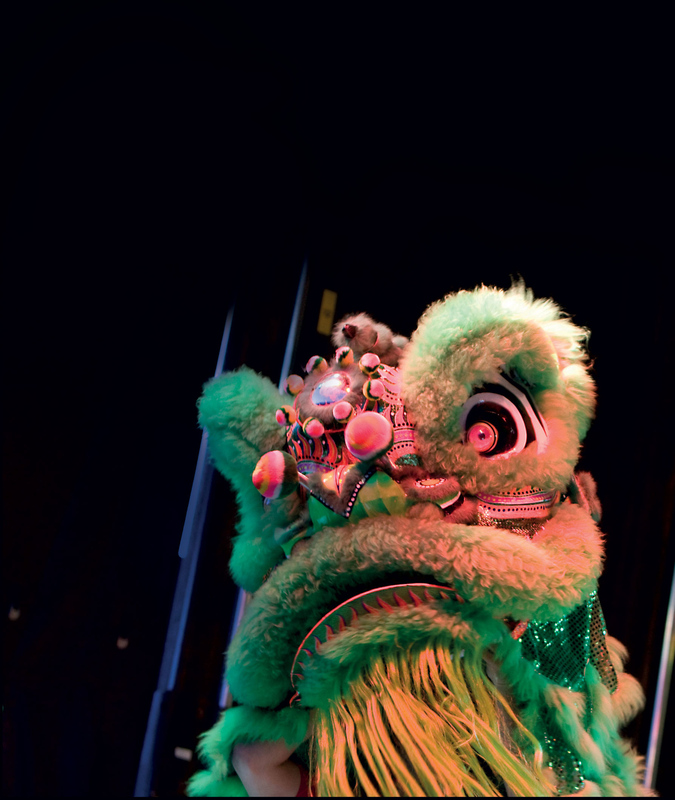 Later in the afternoon, the Djanogly Theatre will host the Nottingham Confucius Institute’s Chinese New Year Gala where audiences will experience a kaleidoscope of fresh and fascinating performances by performers including Sichuan Opera face-changing and Kung Fu of the highest standard. All proceeds from this performance will be donated to the Children’s Brain Tumour Research. Until Sunday 18 February visitors to Lakeside’s Wallner Gallery can enjoy Jiang Hongsheng’s stunning exhibition of Chinese brush paintings where all scrolls on display are available for sale. Hongsheng is the winner of a National Golden Prize for Chinese painting and is also founder of the Red Peony Academy, Ningbo. Join Lakeside Arts audiences on a richly imaginative journey led by two dancers on Friday 23 February at the end of half-term week, in Panda’s Home. This performance, suitable for ages 4+, will teach children about the Chinese Five Elements through encounters in bamboo forests, and with fireworks, kites, and monsters. This brand new visual, digital, and dance performance is a collaboration between TPO and Chinese artists. Theatre: Freddie Flintoff to star in Fat Friends – the Musical for five performances at the Theatre Royal Nottingham Theatre: PHIL DANIELS TO LEAD THE COMPANY IN ROBERT LOUIS STEVENSON’S DR JEKYLL & MR HYDE at Theatre Royal Nottingham Tuesday 20 – Saturday 24 March 2018 **ANNOUNCED** SETTING SAIL TO A NOTTINGHAM NEVERLAND, JOE PASQUALE AND JOHN CHALLIS TO STAR IN THIS YEAR’S THEATRE ROYAL PANTOMIME, PETER PAN Fashion: CITY TO COME ALIVE WITH FASHION, STYLING & POP UP CATWALK SHOWS!